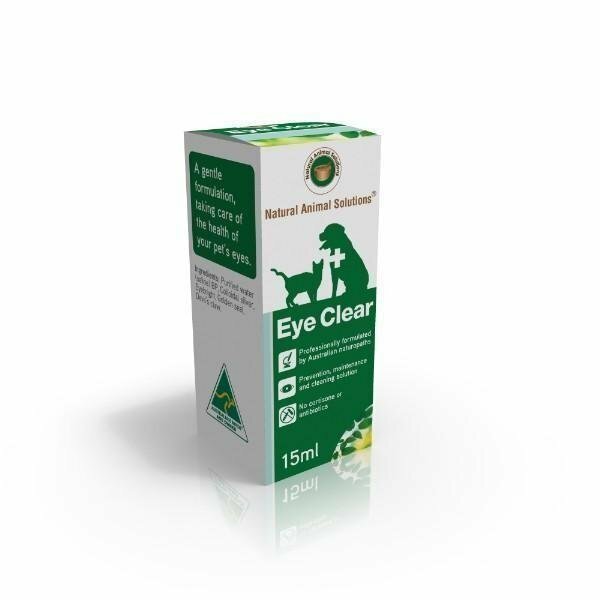 Natural Animal Solutions Eye Clear 15ml helps treat dry, sore, red eyes caused by allergies and conjunctivitis. Eye Clear helps treat dry, sore, red eyes caused by allergies and conjunctivitis. It contains a natural antibiotic, eye toner, and anti-inflammatory. It can be used eye inflammations such as Cherry Eye or prolapsed third eyelid, and can also be used as an eye flush. Great addition to your pets' first aid kit. 100% Natural for use in cats and dogs. Directions: Use 1 drop twice daily as required in the affected eye(s). Ingredients: Saline, Colloidal Silver, Goldenseal, Devils Paw, Eye Bright. If symptoms persist, please seek Veterinary advice. The contents are yellow. Is it normal? Yes, it can be yellow because it is made of herbal plants. Just check the expiry date and make sure the product is not expired. Our puppy has eye discharge from over reacting to allergens in the air- a condition hopefully he will outgrow as he gets older. Instead of using steroid eye drops, Eye Clear works wonders to keep his eyes clear and comfortable, without any side effects. Please keep carrying this wonderful product as you are the only online retailer that sells it to the US! !